This was pretty durn easy, folks. Just sayin. 1. Cook vermicelli according to package directions; drain. Return to pot & toss with chicken broth. 3. Spoon chicken mixture into 2 lightly greased 11X7 inch baking dishes. (I used one 9X13 & it was fine - it barely fit - but it fit!). Sprinkle with cheddar cheese. Freeze unbaked casserole up to 1 month if desired. Thaw casserole overnight in fridge. Let stand 30 minutes at room temp & bake as directed. 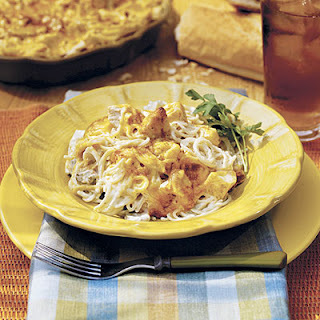 I have an amazing chicken tetrazzini recipe. Let me know if you want it. It is way different than yours. It's so good you won't go back to this one. We make it after Thanksgiving with left over turkey too. You won't need to add extra salt and pepper because there is nothing bland about it. Yummmmmm!!! Yummy! I can't wait to try this one out!